Are We Better Mannered Than We Think? Good manners are very important to Carr & Westley and we are proud of our customer service standards. With this in mind, we are pleased to inform you a new report has found that British people are polite. Now this may not seem like a striking revelation to those acquainted with the cultural stereotype of the Courteous Brit. However the report also found that, rather worringly, British people believe themselves to be increasingly unpleasant. Listen: ‘Britain is not a rude nation’ on the BBC radio 4 today show. I personally think the best way to influence the manners of the nation is one conversation at a time! This entry was posted in Company History on December 12, 2012 by admin. Despite our use of modern day delivery and order channels (like this website), Carr & Westley is, and always has been, a mail order business. 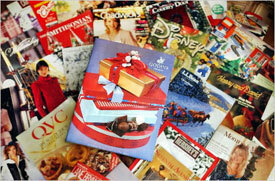 The first recorded mail order catalogue was invented by Benjamin Franklin in 1744. Franklin realised it as a method of spreading word about scientific ideas in his journals and papers. The commercial benefits of such distribution were obvious and in 1848, Alfred Hammacher established the first significant mail order business selling mechanic’s tools and builder’s hardware. Inspired, Aaron Montgomery Ward followed Hammacher’s lead to become the first real pioneer of mail order. Based in Chicago, his single sheet of products in 1872 increased to over 20,000 items within 20 years with his business model built on cutting out the middle man (general stores) – and keeping a bigger share of the profits. By then other companies had seen the value in mail order. Perhaps the most famous of those was US department store – Sears. Still a major player today, in its heyday Sears dominated the mail order market. Formed in 1893 by Richard Sears and Alvah C Roebuck, the first Sears catalogue sold everything from sporting goods to sewing machines, dolls and refrigerators. It wasn’t long before the catalogue had grown 322 pages thick. By 1897, sales exceeded $750,000 and Sears little publication was now being referred to as the ‘Consumer Bible’. In 1908 they even started selling kit houses through their catalogue. It is estimated that between 1908 and 1940 they sold 75,0000 of them, many of which are still around today. One of the very first mail order businesses setup in the United Kingdom was Littlewoods. Still a household name, Littlewoods was established by Sir John Moores in 1932, with the first catalogue consisting of 168 pages. Between 1932 and 1952 Littlewoods opened 25 retail stores thanks largely to its hugely successful catalogue. Moores was inspired to start a mail order business after a research trip to America. Studying the operations of Sears, he brought their ideas back to the UK with him and by 1936 his decision was vindicated with sales topping £4 million. Other UK mail order catalogues quickly followed including Kays, Grattan, Avon and C&A. The popularity of mail order grew as consumers enjoyed leafing through glossy pages at their leisure and the appreciated the convenience of being able to pay weekly. It enabled many to plan well ahead for Christmas and children had great fun choosing toys. Today, thanks to the Internet, the traditional mail order business landscape has changed somewhat. Online shopping may be referred to as ecommerce, but the basic principles are still similar to that of traditional catalogue ordering. Shoppers look at a variety of products, compare prices and arrange a delivery method to suit them – only via a computer rather than a catalogue order form. Many companies have moved away from the glossy brochures and now focus solely on their company website to showcase and distribute products. As far as Carr & Westley are concerned, for the short to medium term at least, there is still a strong need to produce seasonal catalogues. Even though internet sales are increasing, the bulk of our business still comes through catalogue sales and we find it a very useful medium for communicating brand values and creating a tangible connection with our customers. It will be a sad day when the last C&W catalogue hits doorsteps, but we’ve been making them for almost 100 years and don’t see any sign of stopping soon. This entry was posted in Company History on December 11, 2012 by admin.